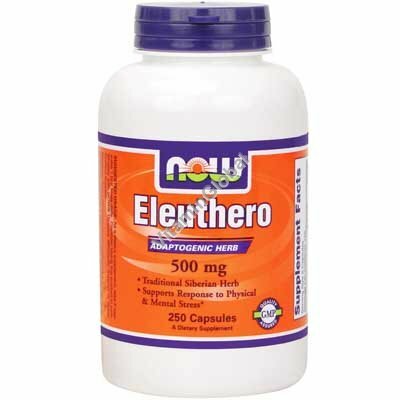 Eleuthero (Eleutherococcus senticosus) is known as an adaptogen, meaning it helps to protect against the effects of physical and mental stress. * The Eleuthero Roots used in our capsules are carefully picked for their high Eleutheroside content. Eleutherosides are the active components in Eleuthero. A law was recently passed regarding the use of the name "ginseng". The legislation requires that any product called "ginseng" must be of the panax genus, or it cannot be called ginseng. In light of this new law, NOW® Foods has changed the labeling of all products formerly labeled as Siberian Ginseng to Eleuthero. This product is not inended to diagnose, treat, cure or prevent any disease.